Around Bonfig, life was sometimes scary, at times embarrassing, at others inspiring, but never less than edgy. His influence in my life (a few months) ranks with that of Mr H C Todd, English master at Slough Grammar (five years or more) and of Arthur Mee’s Children’s Encyclopaedia (1940 to date). 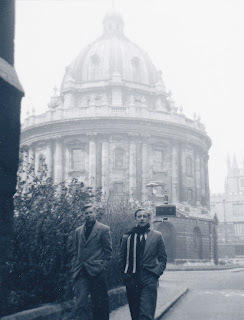 Peter Leech,in their first year at Oxford. Many of my schoolmates, who had opted for Uni first and National Service second, had already completed two years at Wadham and other colleges of that rank One, I found out recently had gone to Balliol. 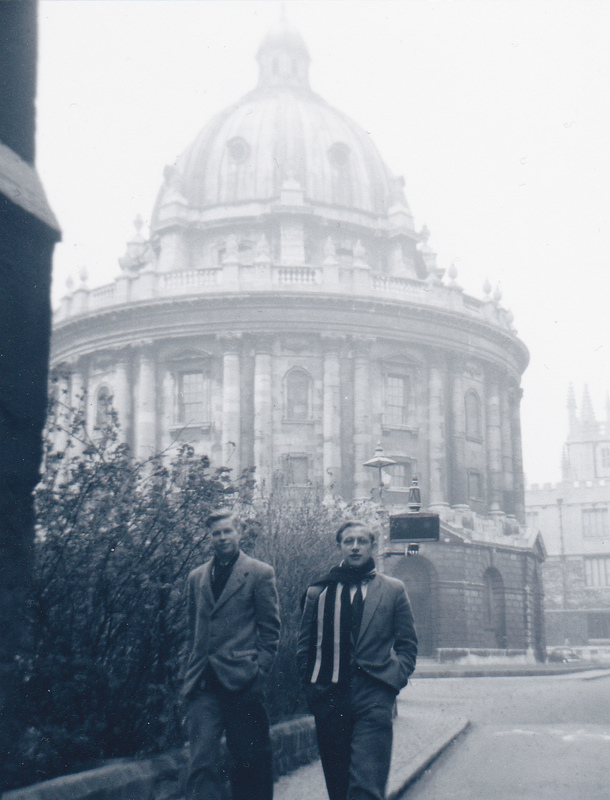 By 1954, when I applied, Balliol had had so many applications that year that I had to sit another exam. Eventually a letter, complimentary but crushing, told me that the standard was extremely high that year and I had not got a place. With the arrogant stupidity of youth, I decided if I couldn’t go to Balliol, I wouldn’t go to any other college. Daft, or what? Bonfig had that sort of effect, on me and I believe on many others. Now and again, I still catch myself wondering what, in some situation or other, he would have thought or said or done. I’m seventy bloody eight years old, for Pete’s sake! Exceptional food and expensive clothes are lovingly and wittily described in Bonfiglioli's novels. He lingers over them like no other thriller writer I've read - and he gets away with it. Yet these necessities of life (leaving aside the adjectives) are but two of the contradictions which not only abounded in Bonfig's life but almost defined it. Only once did Bonfig and I eat out together. It was in a basement cafe just off Union Street, Aberdeen's main thoroughfare. The meal was plain to the point of ugliness, a fried fillet of haddock on an ungarnished plate, served with bread and butter and a cup of tea. Bonfig tried to talk it up, extolling the virtue of simplicity and the Aberdonians' empathy with the sea and its creatures. Was he having me on? I'm still not sure. On the subject of dress, Charlie Mortdecai assumes the status of arbiter of correctness for the occasion. Contrast that with Bonfig's all-too-obvious relief at the limitations of Army dress codes. When my friend of the mountains, Irene, invited me to partner her at her sister's wedding reception, Bonfig's enthusiastic support and advice was almost comparable to that of best man for groom. He was right, of course. No 1 Dress is a smart, very dark blue suit, with contrasting piping in your regimental colours, brass buttons a-shine and a natty peaked cap. I looked great in it. Must track down that picture.